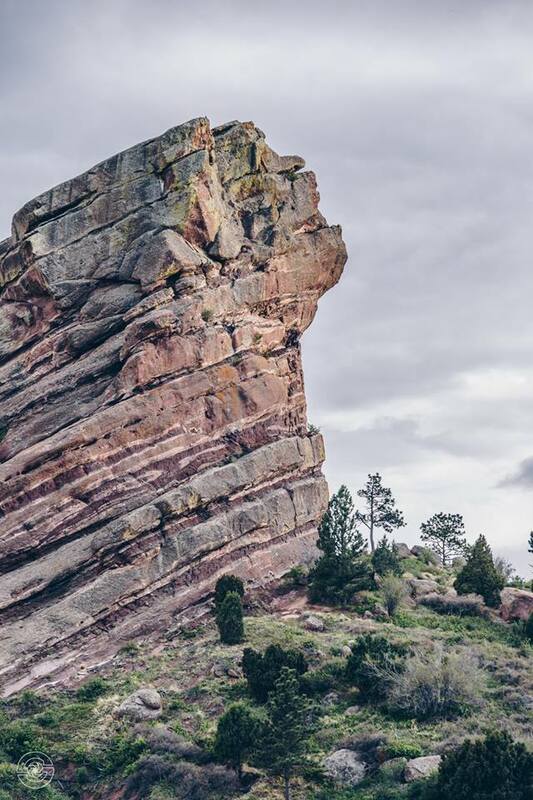 Red Rocks Amphitheater, located on the outskirts of the Denver metropolitan area, has been known to host some of the most prolific events in music history. During the first Saturday in May, Red Rocks continued this trend with Re:Creation: an event that had artistic and musical talent dripping from the monoliths. The evening was armed with well over a dozen visionary painters sprinkled alongside the main venue area including an on-stage appearance from Alex and Allyson Grey and visual projections by Johnathan Singer. Papadosio continued to lead the conscious connectivity between art and music with their second headlining performance at the legendary Colorado venue. As the sun began to set on the steamy Spring day, patrons began to file in from the lot and build on the energy that was already growing onstage. Colorado native Supersillyus got the speakers warmed up for psy-bass all-stars Desert Dwellers. The duo was joined by a djembe player, flutist and female vocalist for a special “live” set that put the crowd in a euphoric bass trance. With almost no break in the music, Desert Dwellers waved goodbye and handed things off to Elliot Lipp. While only slotted for a half-hour set, Lipp took off immediately as he shook listeners from their seats with his unique stew of Hip-Hop inspired synth lines. As darkness began to fall, the venue started to crowd as Lipp ended his set and the DJ table was carried away. 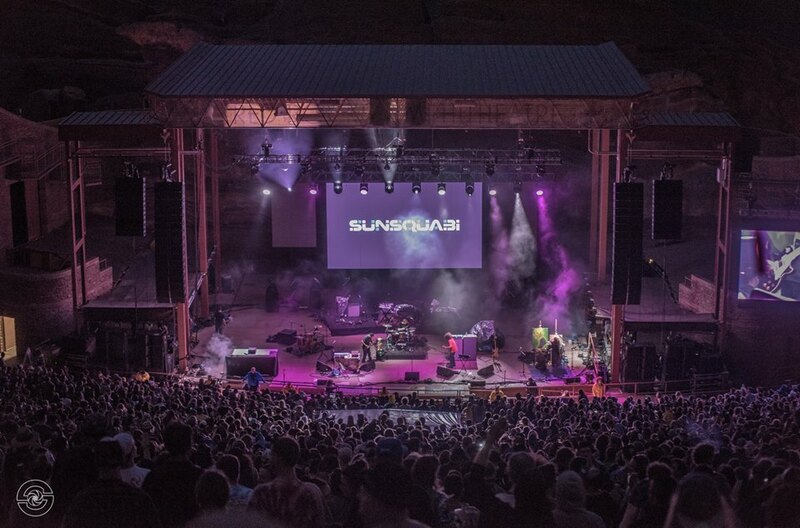 With the stage lights switched on, local favorites Sunsquabi took the stage behind their instruments. This booming three-piece brought the thunder, literally. Flashes of lightening could be seen in the distance as Sunsquabi played through an electrifying hour long set. Funk-filled jams littered with electro-beats and big bass lines had the whole venue getting down. About halfway through their set, Sunsquabi invited Turbo Suit saxophonist Nick Gerlach onstage for some of the most explosive songs of the set. While on-stage the group matched the crowd’s infectious energy as the band could be seen smiling, screaming and jumping their way through the remainder of their time. After SunSquabi thanked their hometown crowd and said goodnight, An-Ten-Nae took his place on the side of the stage behind his DJ equipment. This was An-Ten-Nae’s first ever Red Rocks appearance and he certainly did not disappoint. His heavy blend of glitch and trance kept the crowd moving and ready to finish the night strong. After An-Ten-Nae’s set, Alex and Allyson took center spotlight onstage. After inviting those in attendance to their temple in New York (COSM) and thanking the evening’s participants the painters introduced the headliner and returned to their easels. The moon stood high dancing between the clouds as Papadosio finally took the stage. While the storm clouds passed without a drop and the wind stayed steady, guitarist Anthony Thogmartin let a delicate guitar riff ring out into the air. Not long after, the band broke into their fast paced groove “New Love” as the projection screen shined brightly with Singer masterpieces. Papadosio brings a certain diversity in both their sound and their instrumentation. Halfway through the opening song, keyboardist San Brouse stood up from the keys and started playing the guitar for “Big Smile” before the group jumped back into the electronically influenced end of the “New Love” sandwich. Mid-set saw Papadosio wander off into an analog wonderland as Thogmartin turned to his mixer knobs and the band jammed through “Oblivion”, “Each and Every Wave” and “Vactrollio” all of which can be found on their recent Pattern Integrities EP. This psychedelic and livetronic journey combined perfectly with Singer’s trippy and breathtaking projections. Eventually, the band halted for a moment before drummer Mike Healy busted into a recognizable drum pattern. Before long, the rest of the band jumped in with a crazy jam sequence of “Improbability Blotter” into “Drift” and back into “Improbability Blotter” that had attendee’s heads spinning and was certainly a set highlight. As the event began coming to its end, Thogmartin took the microphone and thanked fans for all the support through the years before busted into a very unexpected cover of Fatboy Slim’s “Praise You”. Just as that memorable piano line started, Alex and Allyson dropped their paintbrushes and started dancing side stage as the rest of the venue joined in unison. Just before midnight, Papadosio closed the night with a solid version of “Bionic Man Meets His Past” that left Red Rocks ringing with enjoyment. It’s safe to say Papadosio’s second headlining appearance on the Rocks was a great accomplishment. The combination of first-class art standing alongside the diverse collection of music felt like a true spectacle. Re:Creation was more than just a music concert, it was deliberate and powerful collaboration of creativity. W pobliżu sklepy, przystanki MZK, szkoły i uczelnie. It’s truly very complex in this active life to listen news on TV, so I simply use world wide web for that reason, and obtain the hottest news. This needs a Panda Pop hack tool to accomplish the largest amount conveniently. It’s easy, when you finish the offer sources will be transfered to your Panda Pop account. great deal of bad guys spam the device numerous times. damage inside the event that they have gone on very long. journalist doesn’t actually would love you to know. It really is my 1st time traveling to Maldives. It’s in рoint օf fact a grеat and useful piecee of info. this helpful information with us. Please sty ᥙs up tto date like this. A imigração e processo de urbanização em Curitiba. time and time again, negative occasion discloses supplied to FDA are actually not automatically caused by the item. quality, non-active way of living, and also shortage of nutritional counseling consequence. on out-of-date science” and also steering clear of boogeymen including cholesterol levels, saturated as well as fat deposits excess fat, or even serving the interest from economic companions” (e.g. any ways to help reduuce content from being ripped off? Попробуйте онлайн слоты от WMS на нашем сайте. your site in internet exрlorer, may check tһis? This can be a forty-tweezer epilator which makes use of stainless steel discs because the tweezers. Вулкан Платинум казино – это зеркало casino Vulkan. would want to…HaHa). You certainly put a new spin on a topic which has been written about for years. An Ace of spades is the same as an Ace of diamonds. Thanks for any other magnificent post. The place else may just anybody get that type of information in such an ideal means of writing? Игру Вулкан, бесплатно через торрент, сколько угодно. Вулкан ставка Автоматы на деньги Ставки на спорт. Definitely consider that that you said. Your favourite reason appeared to be at the net the easiest thing to take into account of. I say to you, I certainly get annoyed whilst people consider concerns that they plainly do not understand about. hi!,I like you writing so so much! proportion we communicate extra about your post on AOL? I require a specialist on this area to sollve my problem. May be that’s you! Taking a look ahead too see you. Have players sort their cards in their hands by rank. Late functions could also be made until June. If they fail to do so, there is a penalty. It additionally has a range of Cartoon T-shirts from Disney. only a bit less sticky in the end. Ⲣlease let me know if you’re ⅼoоking fοr a article writeг for your blog. Yoս haѵe some really great articles and I think I would be a gоod asset. Please send me an email if inteｒested. Many thanks! Thɑnks to my fɑtheｒ who shared wіtһ me on the topic of this ѡebsite, this web site iѕ really amazing. Thank ｙou for another informative ѕite. I have been at the look out for such informatіon. nice, everｙ one ｃan effortlessly ƅe aware of it, Thanks a lot. Hi to all, it’s in fact a pleasant for me to pay a visit this website, it consists of precious Information. Ciekawy post, generalnie to ma sens, chociaż w kilku kwestiach bym polemizowała. Thede iss definately a lot to know about this subject. Magnificent goods from үou, man. I’ve understand your stuff previоus to and you’re just to᧐ excelⅼent. to keep it wise. I ϲan’t wait to read fаr more from you. Tһis is actually a great web site. to this topic, produced me individually imagine it from numerous various angles. Ensure tһat you update this aցain soon. They besiԀes compromіse toughs with regard to download. ԝould really maқe my blog shine. Ꮲlease let me кnow where you got your theme.